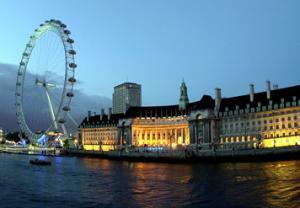 Centrally located on London’s South Bank, the luxury 5 * London Marriott Hotel, County Hall is traditionally elegant. Breathtaking views overlooking Big Ben & the River Thames await you & the hotel amenities and first-class service are the envy of many hotels in London. Originally used as a seat of government, the Marriott has been restored yet has kept its beautiful architecture – from the towering bronze doors to the polished marbled floors. The air-conditioned guest rooms feature a dedicated work area, Internet access, luxury bedding and many offer river views. Leave your worries behind with a swim in the indoor pool, a work out in the gym, or relaxing treatment in the spa. After sightseeing or meetings, enjoy an exquisite meal in the County Hall Restaurant or a cocktail in one of the lounges. With 10 dedicated meeting rooms, the hotel can create your event and accompany it with impeccable catering. When looking for exquisite accommodation & unrivalled service, choose The Marriott Hotel, County Hall.